A few weeks ago, I found myself in Penzance, Cornwall, trying to escape the everyday for a (rainy, blustery) weekend. I'd travelled there straight after attending FantasyCon, so I had a suitcase full of books with me. Nonetheless, when I spotted The Edge of the World Bookshop, I found myself irresistibly drawn to it. With a name like that, how could any bibliophile resist? Inside the busy, crowded little shop, I browsed until I stumbled across Deep Water, a book I have not seen in shops elsewhere. A stunning cover, a blurb by Malorie Blackman, and a description that sounded very enticing made it hard to resist. I'm glad I didn't resist. 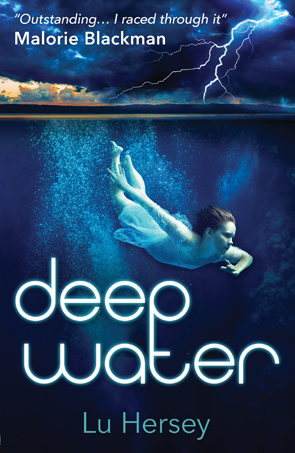 Deep Water is a young adult novel, at the more literary and atmospheric end of the genre. Our hero, Danni, lives with her mother in England. One day, her mother does not return from work, and Danni slowly begins to suspect something may be wrong. When her mom still isn't back in the early hours of the morning, she raises the alarm, calls her (divorced) father, and waits for news that can only be terrible. While the police search for her missing mother, they insist that Danni has to be in the care of an adult, so her scatterbrained hippie father is the only palatable option. Danni temporarily moves in with him. He happens to live in Cornwall now, where he runs a new age shop. Her mom was originally from Cornwall, too, but has not returned there for many years. Deep Water is an atmospheric novel, slowly building up tension and a sense of dread, but also a sense of mystery. It's very much a novel where place is a character - Cornwall is in the DNA of the novel just as much as a love of the mythical. This isn't a cute little fairy tale - it's a thriller with mythical, magical elements, deeply invested in coastlines and landscapes, places and small community life. It's the sort of story that all too rarely makes it into cinema screens - perhaps the superb Ondine is the closest comparison in terms of atmosphere. If you like Alan Garner's novels, you'll enjoy Deep Water just as much. It's really rather good.